Rashelle Pershman, finalist, Templeton grade 6. In all, 38 students in grades 5-8 participated in the bee. Students who won classroom or school spelling bees vied for the honor of participating in the District Spelling Bee. 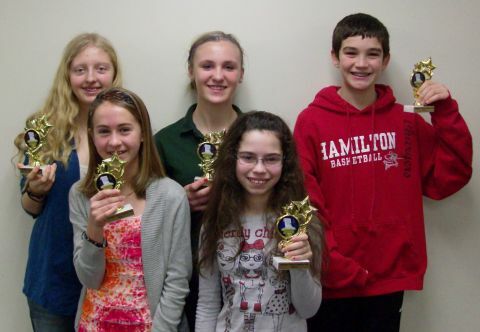 Top spellers of the district level bee advance to the Feb. 8 regional bee at CESA #1 in Pewaukee. Regional winners continue to the Wisconsin Spelling Bee, in hopes of qualifying for the Scripps Howard National Spelling Bee, to be held next June in Washington, D.C.
Peace Lutheran – Robert Frerking, Grace Kirk, Julia Perry and Anders Rhode. Jacque English, Templeton Middle School Spectrum resource teacher, coordinated the Spelling Bee.